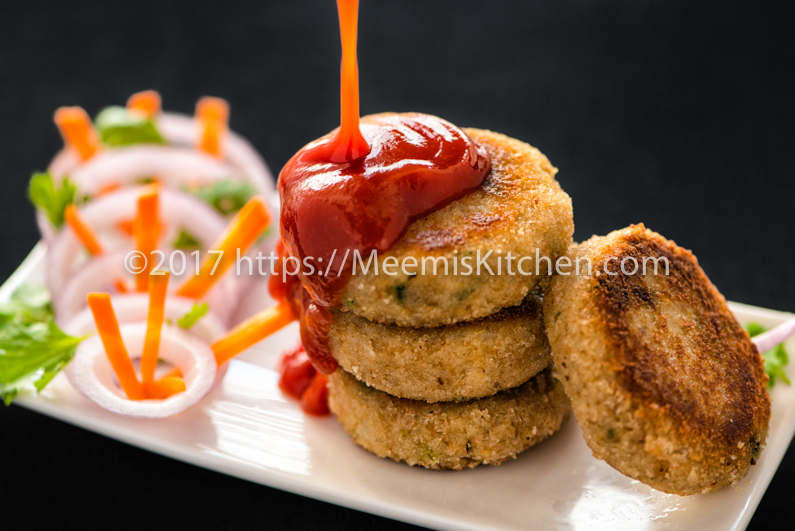 Soya cutlets are healthy, nutritious and tasty appetizers or snack bites seasoned with herbs and spices. 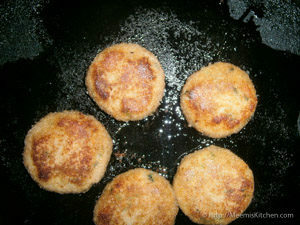 These pan fried Soya cutlets/ meal maker cutlets are made with Soya granules and are quite easy to prepare. Complete with nutrients and proteins, Soya is rated as one of the best Vegetable protein and a great meat substitute for vegetarians! Rich in calcium, Iron and protein, Soya is highly recommended for growing children as well. Check below to know more about the health benefits of Soya. I was little apprehensive, initially to try this out. Quick bites like Chicken cutlets, Beef Cutlets, Paneer cutlets, Fish cutlets, Potato croquettes, Calamari rings, Chicken 65, Banana fritters, Samosa, Spring rolls etc. are heartily relished and are much in demand here. As for Soya, I always felt it was plain and bland, so I was scared to try. Hence, I delayed making Soya cutlets, although, I brought this Soya Granules packet long back. When I first prepared Soya Manchurian, I had the same inhibition, but it turned out super scrumptious! It was my dear friend Blessy, who assured me about Soya cutlets and encouraged me to give it a try. The new snack was welcomed wholeheartedly and I was overjoyed. 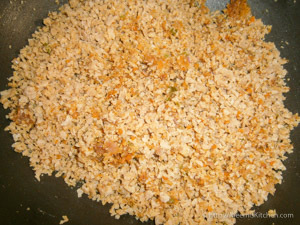 Soya granules/ Kheema turned out easier to cook than soya chunks. Initially, I made this mistake of using the entire 200 gms packet, and I had to keep aside almost half of it as I had not enough potatoes. 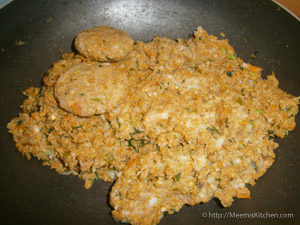 For making the cutlet mix, I added spices generously with carrot, onions and also some fresh coriander leaves. First time, the Soya cutlet mix was little sticky because of the starchy potatoes. consequently, I added some bread crumbs to the mix and shaped them. But the second time, the potatoes were good and it came out perfect. Soya cutlets can be substituted as burger patties, or can be used to make delicious sandwiches with Mayonnaise and tomato slices. It is also a great evening snack with some tomato ketchup, onion rings and carrot juliennes. I recommend you to try the pan fried method as it is healthier than the deep fried Soya cutlets. While deep frying the bread crumbs brown quickly. So, try this delicious and nutri rich Soya cutlets today. Happy and healthy eating! Green Chillies : 4 nos. Bread slices : 6 – 8 slices. Wash the soya granules/ Soya chunks and soak with boiling water. Keep it covered for 15 minutes. Squeeze it and rinse again with fresh water and squeeze again and keep aside. If you are using Soya chunks, pulse/ mince it into coarse grains. (Granules are easier as you can skip this step). Boil the potatoes in the pressure cooker. Chop the Onions, ginger, chillies and carrots finely. Heat 2 tbsp oil in a Kadai. 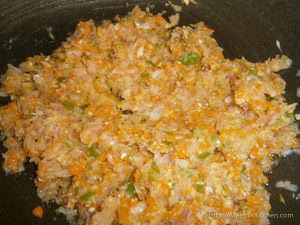 Add the chopped onion carrot mix and fry for few minutes stirring continuously. 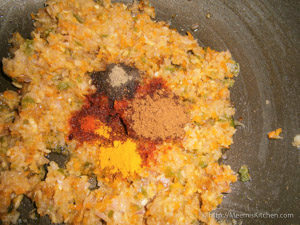 Once it turns slight brown, add turmeric powder, pepper powder, chilli powder and Garam Masala. Sauté for some time and add the cooked Soya granules and mix well. Fry for a few minutes stirring all the time. Finely chop the coriander leaves and add to the pan. Put little extra salt for the potatoes, turn off heat and let it cool for some time. Peel and mash potatoes and add this to the Soya cutlet mix and combine well. Take small balls and firmly press and make round shapes with your hands or cutlet shaper. 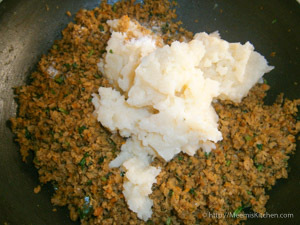 If you find the mix too sticky, add little fresh bread crumbs or rice powder. 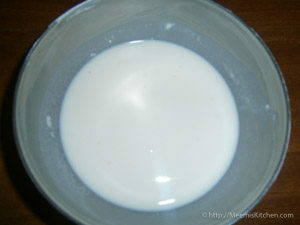 Make a medium thick paste with Maida, corn flour and water. Grind the Bread slices to make coarse bread crumbs. 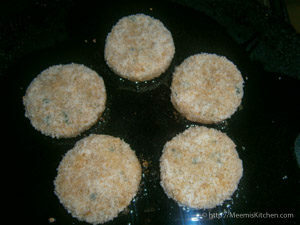 Dip the cutlets in the batter and roll in bread crumbs. Heat a Tawa or pan and sprinkle little oil. Place the cutlets and fry both sides on medium flame till golden brown. Enjoy it hot with tomato sauce and onion rings. Check this link on “How to make Garam Masala at home” for best results. 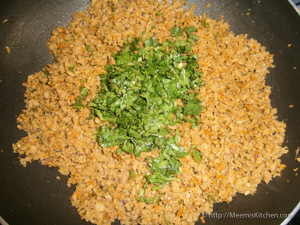 Coriander leaves add to the flavors; you may use little mint if you like. You may also try deep frying, but Tawa frying is recommended as it is equally tasty and healthier. Toast on medium heat till golden brown for best results. 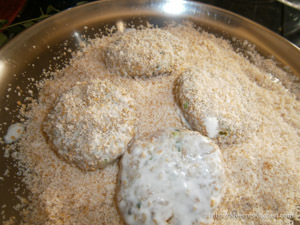 You may also cover the cutlets with a lid, while it is pan fried. Instead of Maida batter, you may also dip in beaten egg and roll in bread crumbs. 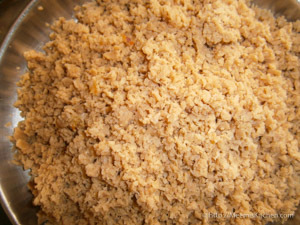 For making fresh bread crumbs, use two days old bread which makes it crispier. Soya are high quality Vegetable protein, a perfect and economical substitute for meat based proteins. It is rich in calcium and proteins and helps to boost the teeth and bone health in growing children. Low in fat and sodium, it helps to control Cholesterol and reduce the risk of heart diseases. Packed with minerals and fiber it is great for a healthy diet. Soy products are considered the best non – fish source of Omega 3 fatty acids which are essential for your diet. Particularly recommended for women as it regulates the estrogen levels and promotes heart and bone health. Relish the delicious and nutritious Soya cutlets with Tomato Ketchup and onion rings. Please let me know your feedback and suggestions if you like this recipe and also share with your friends using the share buttons below. It would encourage me to share more yummy recipes. Thanks and God Bless! !